Rove's Crossroads GPS Gets Explicit In Anti-Obama Air War : It's All Politics Crossroads GPS, an anti-Obama group co-founded by GOP political strategist Karl Rove, is shifting its ad strategy. It's going from so-called issue ads that purportedly educated voters on why the president was wrong on issues to directly urging for voters to vote against him. 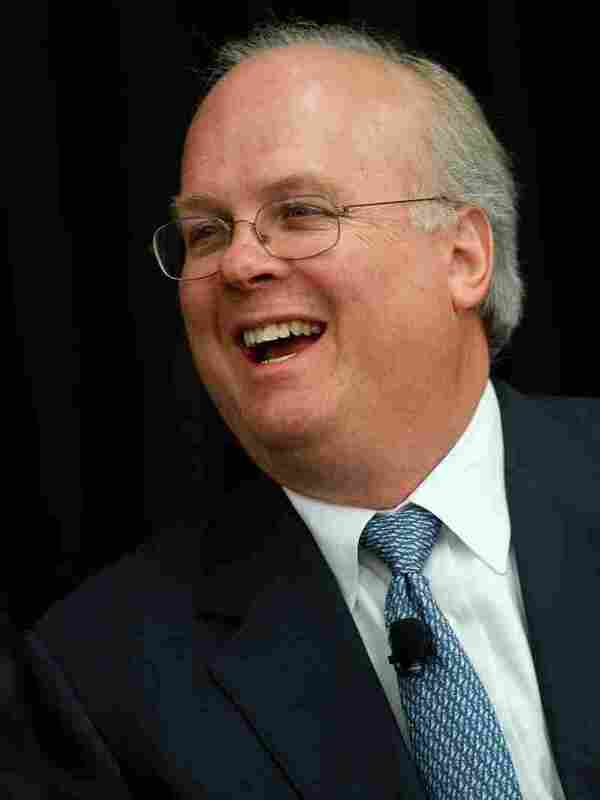 Karl Rove co-founded the Republican superPAC Crossroads GPS. For months, the tax-exempt Crossroads GPS has argued that its anti-Obama ads were merely issue ads and not political ads. No more. Today the group went up with ads explicitly telling viewers to vote against President Obama. Co-founded by Republican operative Karl Rove, the group began running a 30-second spot Wednesday morning in Nevada that blames a weak economy and poor housing market on Obama and ends with the wording: "This election ... don't blow another vote on Obama." In election law, that message is called "express advocacy." Running such ads allows groups like Crossroads GPS to take advantage of a legal loophole and keep its donors' names secret. Undisclosed donors are not allowed to pay for "issue" ads within three months of the election in the presidential race, and within 60 days of Election Day for Senate and House races. So those earlier Crossroads GPS ads urging viewers to call Obama and tell him to cut the debt (or stop wasteful spending, or whatever) are out. Running them would have required the group to reveal every donor who had given more than $1,000. The new ads against Obama will cost the group about $900,000 over the next 10 days. Similar ads urging voters to defeat Democratic Senate candidates in North Dakota, Virginia, Nevada and Ohio will cost another $2.7 million. "Nonprofit organizations are allowed to dedicate some of their resources toward political activity. And that is what you're seeing," Crossroads spokesman Jonathan Collegio told NPR Wednesday. While Crossroads GPS may have been founded by political operatives and its ads may have seemed political from the start to the casual viewer, the group actually organized as a nonprofit, a so-called 501c4. IRS rules do not specify exactly what percentage these groups can spend on politics. They require only that their primary goal must be "social welfare" and not politics. In its first 18 months, Crossroads GPS raised $67 million of its total $77 million from as few as 16 rich donors. What it has raised this year, and how much came in large donations, will not be disclosed to the IRS and the public until April 2013. Crossroads GPS spent more than $50 million on ads attacking President Obama this spring and summer. But its officers do not believe those count as political activity because they did not tell viewers to vote against Obama.